For the first half of the year everything ran smoothly, and I was laughing at myself for being so fearful of the switch- my students were using their computers responsibly and they seemed no more or less distracting than a piece of paper would be. There were a few violations here and there, but it was so rare I didn’t even keep track of them. It seemed so easy that I even started composing a blog post about going paperless the “painless” way. However, as the year moved on and those teenage hormones started kicking in, I noticed a sudden uptick in bad technology behavior. More and more students had lost their charger and almost every class someone had to go on a “charger hunt” around the classroom to find one to borrow. The chat feature in Gmail became more popular with students, who started routinely chatting with friends in other classes. Certain students also started getting sneaky about staying on task, quickly switching their computers from one screen to another. All of this made me start to feel like a technology policeman, keeping a watchful eye on potential criminals and doling out punishing justice whenever a caught an offender. It wasn’t painless any more. What I thought were simple consequences also turned out to be problematic. How do you confiscate a student’s computer in a paperless classroom? In some cases I could just print out their document and let them continue on paper, but what if the learning activity involved a simulation or creating a movie? All technology violations are not created equal either, so I had to make tough judgement calls about whether students needed a reminder or some kind of consequence. To improve things for next year I know I need to be more proactive and prepared. Now that I know the most common problems I will encounter, when we make our technology rules up for the year we will need to discuss more specific examples so expectations are clearer. We will need to review our rules too, probably once a quarter to keep them fresh in student’s minds and also to be able to make changes if we need to. In terms of accountability, next year I’m going to base our rules on our Middle School’s Learning Habits. These are similar to the school’s core values, but they are more specifically about behavior and students receive grades on these every quarter. This way students would get feedback on their technology behavior in their report card, which would help hold them accountable. I will need to keep better track of both good and bad technology behavior, and perhaps even use something like Class Dojo to communicate this with students. Also, by tying our rules to the Learning Habits students could self-assess themselves periodically so it wouldn’t just be me as a technology policeman. As for consequences of failing to use technology properly, I need to rethink these to make them more effective and to help students make better decisions. Instead of just a verbal reminder the first time, I think making it visual by attaching a Post-it note to their screen would be a helpful reminder. A discussion after class could also be part of this process, so the reminder is not just shrugged off. If student continue making poor choices I need be more prepared to have them go back to paper. This way I can move students to this swiftly when the laptop is getting in the way of their learning. So overall it was a year of a lot of learning for me, successful but certainly not painless! I’d love to hear other ideas and suggestions from other teachers out there about how to manage technology well. The school year has come to a close, and I finally have time to blog again! This year I experimented going paperless in my science classroom by using digital science notebooks- an online version of the classic science notebook that I set up using GoogleSites. I’ve already blogged about setting that up, so I won’t go into the details here, but I’ve received so much interest from teachers about digital notebooks that I plan on making some how-to videos this summer, so stay tuned! What I’d like to do in this post is start sharing my thoughts on how the digital science notebooks worked (especially in light of my goals from the beginning of the year), and how I’m planning on improving them for next year. There’s a lot to reflect on, so I think I’ll post it one nugget at a time. My first reason for going paperless was to help students stay more organized, without consuming class time with menial tasks like sorting papers into binders or gluing sheets into notebooks. To accomplish this, all of my “handouts” were Google Docs, which are easily shared with students using Hapara. 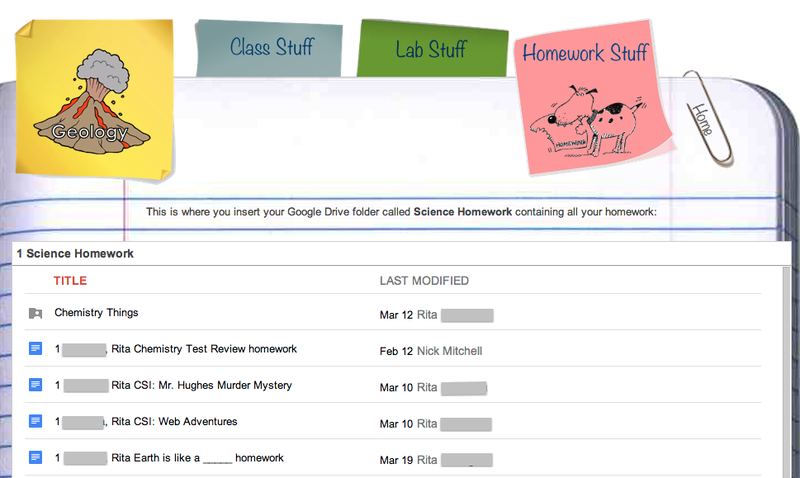 My students had three folders on Google Drive which contained all of their documents: Science Class, Science Lab, and Science Homework, and could access these documents either directly through Google Drive or through their digital science notebook on GoogleSites. So opening up a document wouldn’t take longer for students than passing out a stack of papers. Each time we completed a unit of study we did a little clean up with their folders to put all their documents in a sub-folder, which would take about 5 minutes in GoogleDrive. The biggest digital advantage over paper is that students never lose documents- so that excuse becomes totally obsolete. Another handy benefit is that students who are absent in class get the documents digitally anyway, so they can get caught up even before the next class. One simple improvement for next year is the way I named student’s documents. I used the Hapara feature of including the student’s name automatically in the document title, which makes searching up a specific student’s document a cinch, but I should have also included a number at the beginning of each document title (01, 02, 03, etc). This would make documents appear chronologically in on students’ digital science notebooks, which unfortunately only lists documents in alphabetical order. Numbering the docs would not only make new documents easier to find, it would maintain a clear chronology of learning for students to see, much like a paper science notebook would.